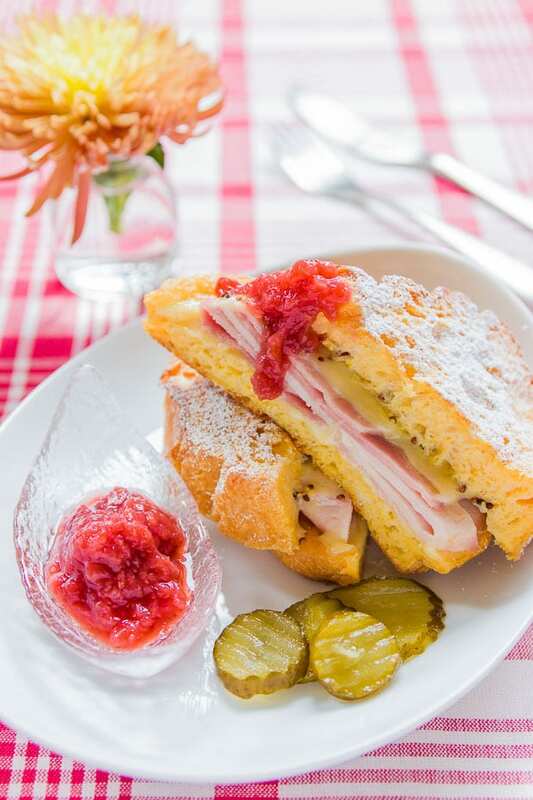 Crisp on the outside, custardy on the inside, this perfect Monte Cristo Sandwich with Ham, turkey and Swiss can be picked up with your hands. As someone who can’t put down a stack of pancakes without some ham, bacon or sausage to disrupt the sweet monotony, I love contrasts in food. While a delicious aroma or stunning presentation may entice you to take the first bite of something, it’s the contrasts that keep you going back for a second and third bite. Despite all its splendor, the Monte Cristo somehow didn’t make it onto Thrillist’s list of the 50 greatest sandwiches ever known to man; disqualified on a technicality. As they put it: “If you can’t pick it up with your hands, it isn’t a sandwich.” I was annoyed at first, but upon further reflection they make a good point. Because a Monte Cristo uses french toast instead of regular bread, the sandwich is often oily and limp, making it a challenge to with two hands, let alone one. Add to that, the strawberry jam, and you have a hot sticky mess on your hands that doesn’t exactly embody the spirit in which the sandwich was created. My french toast recipe uses a little flour to help keep the exterior from becoming soggy. While it does keep the french toast from going limp, it never quite manages to make the outside crisp. Taking this logic to the next level, I wondered what would happen if instead of adding flour to the custard, I dusted the exterior of the soaked bread with flour. As it turns out, it works…. brilliantly! French toast made in this way ends up soft and custardy on the inside and cracker crisp on the outside. Instead of a floppy “sandwich” that needs to be eaten with a fork and knife, a Monte Cristo made in this manner, is a sandwich that can be eaten single handedly, while still retaining all the marvelous characteristics that make it so good in the first place. 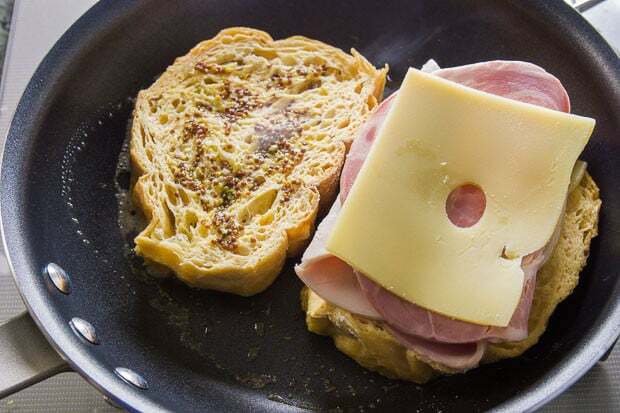 To help hold things together on the inside, I use a double layer of cheese on either side of the ham as a glue that keeps the insides from spilling out as you eat. As for the bread, I recommend using a cheap grocery store “French” bread with a crisp rather than crunchy crust and airy wonderbread center. You know, the kind of bread that would get you lynched by an angry mob in Paris. Why cheap bread you ask? Well, there are a couple of reasons. The first is for authenticity. Despite its elegant name, the Monte Cristo Sandwich wasn’t invented on some fancy yacht in the French Riviera, nor was it a creation of Alexandre Dumas’ fictional character, who was out to settle an epic beef. While the Monte Cristo is undeniably inspired by the French Croque Monsieur, it didn’t start appearing in its current form until the 1950’s in the US. About a decade later the Monte Cristo Sandwich showed up on the menu at the Blue Bayou restaurant in Disneyland, which cemented its place in the American culinary repertoire as it spread its way across the country through diners and dives. This leads me back to the bread. These roadside diners that gave rise to the Monte Cristo Sandwich weren’t using authentic Parisian baguettes, they were using pillowy soft rolls and sandwich bread to make this sandwich. In order to stay true to it’s inauthentic roots, a Monte Cristo requires mediocre bread. The second, more practical reason for the cheap bread is because the light airy structure of cheap bread gets crisp, instead of hard and crunchy, which is exactly how we want this sandwich. As for the amount and type of ham, it’s really up to you and your preferences. I used two slices of a ham, and one slice of turkey, but this would be just as good mounded high with pastrami or Jamón serrano. 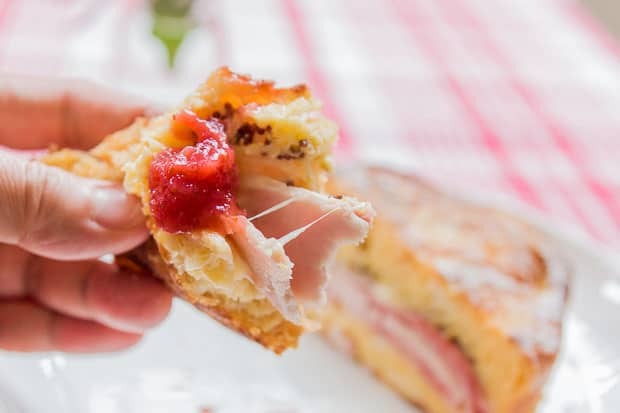 For the jam, I’m a strawberry jam guy when it comes to Monte Cristo Sandwiches, but I could see this working with a Fig Preserve, Onion Jam, or pretty much anything else you may have in your pantry. Whisk the cream, milk, egg, sugar and nutmeg together in a bowl until the egg is fully incorporated and there are no clumps of egg white or yolk. Put the bread in a sealable bag and pour the custard over the bread. 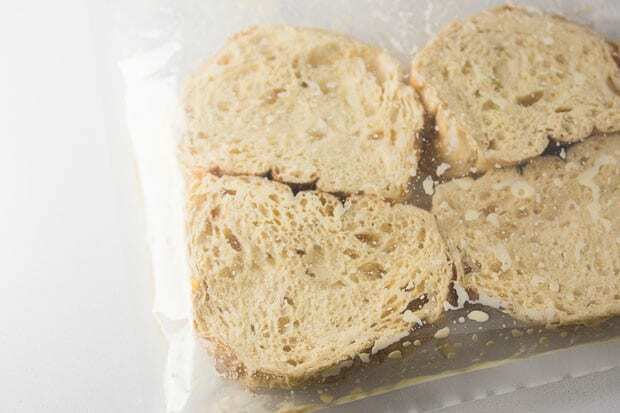 Seal the bag, pressing out as much air as possible without smashing the bread. Let the bread soak overnight. The next day, put your oven rack in the middle position and preheat to 350 degrees F (180 C). 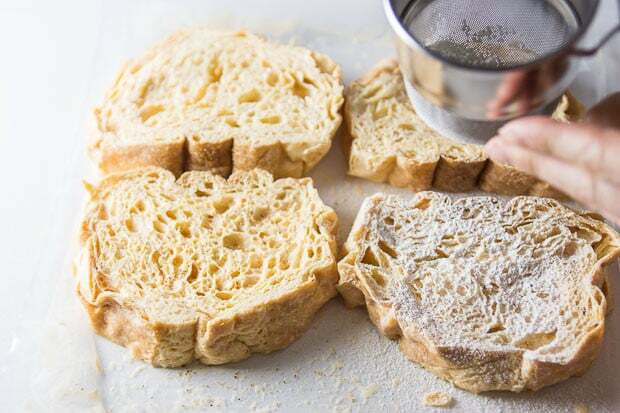 Lay the soaked pieces of bread on a flat surface close together. Put the flour in a fine mesh sieve and dust one side of the bread with an even coating of flour. Put the butter in an oven-safe frying pan that's large enough to hold all 4 slices of bread and melt over medium heat. If you don't have a pan large enough (I didn't), you can just do it in 2 batches. When the butter is melted, add the french toast with the floured side down. While the bread is frying, top 2 pieces with mustard and the other two with a layer of cheese, ham, turkey and cheese. When the sandwiches are done, dust generously with powdered sugar, slice in half and serve with jam and pickles. There used to be a restaurant in Atlanta that had the Monte Cristo as a mainstay of their menu.. When we were “very” good as kids, our folks would take us to get one. As a child, it was the closest thing we did as “sinful” – eating sandwiches with powdered sugar and jam. Thanks for bringing back a forgotten memory! I love these things; always something that’s at the top of my list when I go out with friends for brunch and I’m even wondering now to myself…why have I never done them? They would also be perfect for what my kids used to call Brinner. Breakfast type foods we would occasionally have for dinner. Mmmmm…now this looks good! I love the sweet and savoury flavours going on here Marc. This was a diner favorite of mine growing up, sort of a big girl grilled ham and cheese. I used the egg batter method with Texas Toast for a tuna salad sandwich and it was wonderful. I’m convinced you can do this with practically any sandwich! Y’know, I don’t think I’ve ever had a Monte Cristo (and of course, because I’m not Amurikan after all), but it sounds kind of confusing. Yet I’m prepared to try it! Either I’ll have to find a diner when I’m Stateside, or wait until March when I make it home to London! OMG, when ever i go to Blue Bayou restaurant at Disneyland this is a must! I dream about the Monte Cristo sandwich, thank goodness I have a pass, its always a stop for me and my family when want a sweet yet savory sandwich. LOVE IT!!! Wow! This looks amazing. My son made a similar sandwich for breakfast the other day, but without the egg dip/french toast thing happening. When I showed him this, he was all for it! Nothing beats a well made Monte Cristo for brekkie! The last Monte Cristo that I was served had two fried eggs added to it—AMAZING! I love Monte Cristo sandwiches. I often order them at the diner when we go out to eat after a night of partying! I sometimes make Monte Cristos. They are a nice alternative to an average sandwich. I think jam can be good on any sandwich! Loved these as a kid. Mom always used red currant jelly, though. Thanks for the trek down memory lane! This looks so good and alot healthier than the monte cristo you see in restaurants. Gahhh! i Orson’s Blueberry & Thyme Monte Cristo. your triple decker version looks pretty badass though. happy new year, marc! oh marc i don’t come to your fabulous site enough. so many perfect food photos to catch up on. you have such incredible talent. i would love to see your take on an asian style roast. I have not had this calorie laden sandwich is such a long time.. it was one of my favorites after hitting the clubs and heading to Bennigans? I think I met up with my mother and her coworkers.. I can’t remember where I had it first but I did love it… Looks like I can make this fab sand at home them. Well, my tastebuds have been through their share of confusion, what with eating my cooking and all, but this definitely looks like the good sort of confusion. Love the monte cristo, and your version looks and sounds delicious. OH YUM! I love, love, LOVE this sandwich! Again, delicious. Love it, and the pictures, oh my. this is one reason why i hate coming here… soooo many good food that it’s always making me hungry. monte cristo is my topmost fave sandwich of all time! when i used to live in the DC area, i used to go to the Dubliner (on Capitol st). their monte cristo is topped with hollandaise sauce which is also sooooo good! This is one of the worst attempts to make a Monte Cristo that I have seen here on the internet. This is not even close to a real Monte Cristo, Please do not give up based on this travesty of a recipe . Thanks for your thoughts! I always welcome a productive discussion about food and it’s origins and I’d love to hear more about your thoughts on what makes a “real” monte cristo? Looking forward to hearing back from you! They never seem to reply, do they? Well, you just brush that off and enjoy your sandwich. I love the pix too, now i really want a strawberry with some confectioner’s sugar!! I had this in a restaurant once and fell in love with the combination of flavors. I make french toast all the time, so added a few extra ingredients shouldn’t be a problem. I am looking forward to making this for dinner! Thanks for giving us pictures and an easy recipe to follow. 🙂 My favorite thing to eat at Disneyland is the Monte Cristo. Looking forward to trying this version at home. I only have large eggs…. Should I just double the egg? Hi Yogicfoodie, doubling is probably a bit too much, but this is one of those things where you don’t need to be exact. So you could just use 1 and be a bit short or use 2 and have a bit too much. The only thing it will effect is how much the custard will set (i.e. the center of the french toast). Less = softer, more = harder.